The SOLAR SYSTEM, with the Orbits of 5 remarkable COMETS. 1337 - ????. Most likely the Perseid Comet. Bowen does not offer a return date, but if it is the Perseid Comet, it reappeared in 1468, with 131 year window. The speculative nature of this comet's path is indicated by a dotted line. 1590 - ????. Another speculative comet, but most likely an early observation of Halley's Comet, which appeared in 1590. 1661 - 1789, 129 years. In all probability Comet Ikeya-Zhang which reappeared in 2002. The 18th century calculations performed by Johannes Hevelius giving this comet a 129 year orbit were apparently incorrect. The Chinese and Japanese astronomers Zhang Daqing and Kaoru Ikeya, respectively, recalculated the course of the comet following its 2002 appearance giving it a 366.51 year orbit, the longest of any periodic comet. 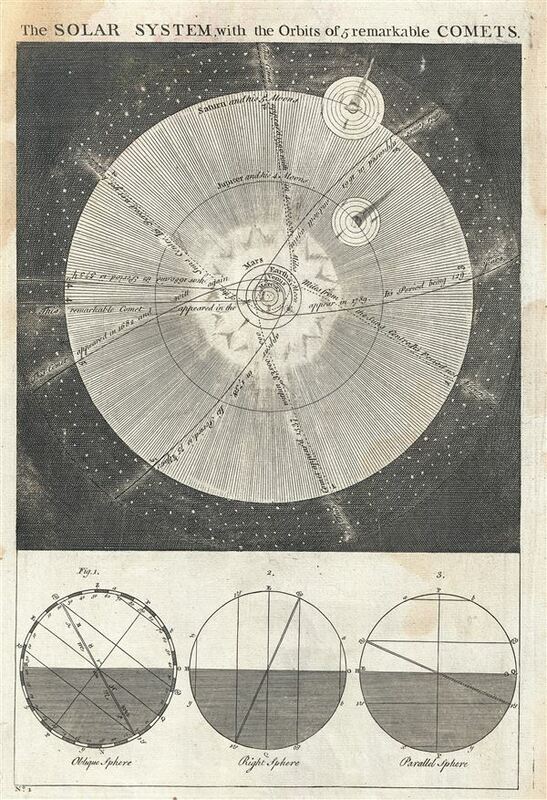 1680 - Doubtless this is the Great Comet of 1680, also called Kirch's Coment or Newton's Comet. Visible even during the day with a spectacular tail that bisected the night sky, this was one of the brightest comets in recorded history. This sungrazing comet was discovered by Gottfried Kirch and Eusebio Kino (better known in map circles for proving California's peninsular nature). This comet was also used by Isaac Newtown to test Kepler's laws. As a non-periodic comet it is not known when or if this spectacular satellite will return. 1682 - 1758, 75 1/2 years. Halley's Comet, which appeared in 1759 and has a 75-76 year orbit. This chart was produced by Emanuel Bowen for issue as plate no. 1 in the 1747 first edition of his Complete System of Geography. Very good. Some offsetting. Original platemark visible.